Habitat: Rain Forest, Temperate Forest, Grassland, caves, and hollow trees. Diet in the wild: Small mammals, bats, birds, and lizards. Diet in the zoo: small rodents. 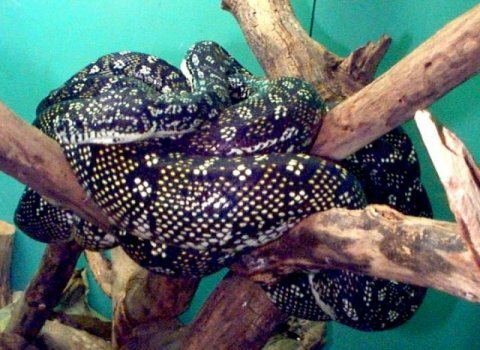 Location in the zoo: The Diamond Python is located in the zoo's Herpetarium. Physical description: A handsome snake with white spots. There is also a definite diamond pattern on the snake's scales. Body Length 7-9 feet in captivity 10 to 12 feet in the wild. The Diamond Python is covered in an intricately designed diamond pattern. It is covered with white spots, and normally, there's a spot on each scale. The Diamond Python is a member of a group called for "carpet pythons" for their beautiful patterns. In the wild, males outnumber females by a factor of 5 to 10 fold. Females lay clutches of 4-16 eggs. The female snake coils around her eggs and shivers to incubate them until they hatch. The brooding coil helps the female to conserve her own body heat. During the incubation period, the female may lose 30% of its body weight. The snakes are nocturnal, spending their evenings in search of prey. However, they are more ambush feeders than active hunters, lying in wait for potential prey moving along animal trails. As the snake grows, mammals make up a larger part of its diet. Diamond Pythons are constrictors that strike quickly and then coil themselves around their prey. The bones in the jaw and the skull are loosely connected to allow their mouths to widen in order to consume even animals larger than themselves. Pythons have a row of heat-sensing pits on the upper lip, and teeth in the upper jaw. Although their eyesight is poor, they have a good sense of smell and rely on that plus their ability to sense the approach of warm-blooded prey. Diamond pythons can tolerate lower temperatures than other python species. Their dark color may increase their ability to absorb heat. 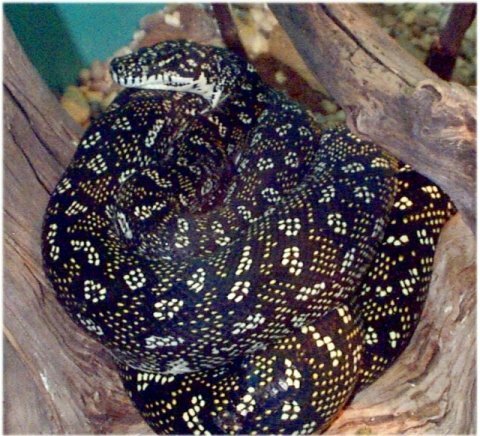 The Diamond Python was briefly threatened by the outbreak of a disease called DPS (Diamond Python Syndrome). During this outbreak, the body structure of the pythons were weakened, and when held they felt jelly like and some snakes experienced tremors. The Fort Worth Zoo is the home to only one Diamond Python. It is housed in the zoo's Herpetarium. The Diamond Python is isolated but surrounded by other snakes. Occasionally, the zoo keeper adds mist to the python's cage to simulate rain. My observation of the Diamond Python was very exciting. It was very active in its cage, and seemed to move gracefully. When I leaned closer to the cage, it tended to extend its tongue. Since snakes use their tongues to smell, and find direction, it's possible he was searching for my scent. The Diamond Python is a very handsome snake. It was amazing to see how continuous the pattern on its scales was. As it moved, the spots on the scales made a beautiful pattern.